When the heat of summer is on, there’s no better way to beat it than by heading to the cool, refreshing Smoky Mountains of Haywood County, NC. There are endless reasons why Haywood is the best vacation spot to cool off in during the summer, so we’ll just throw out a few of our faves. For starters, Haywood County has 25 total mountain peaks soaring to elevations of over 6,000 feet, which makes it the county with the highest mean elevation east of the Rocky Mountains. And we all know the higher the elevation, the cooler it gets, so start climbing! We’ve all tried to beat the heat in a neighborhood swimming pool, but trust us: you haven’t truly cooled off until you have taken a leap into a mountain-fed, natural swimming hole. Swimming holes are natural pools of water created by our local streams and rivers that are perfect for swimming. Haywood County is home to many awesome swimming spots, so we will just share a few of our favorites. Just a few miles above Lake Logan on the Pigeon River, Sunburst is one of the easiest swimming holes to get to. Bonus: there’s plenty of parking. It’s the perfect spot to unload a cooler and grill thanks to the easy access. You’ll find an upper and lower swimming hole, plus plenty of rocks and beach areas to relax. Sunburst Campground is located across the road and offers a great picnic area. The trail head is located across the road from the Looking Glass Overlook parking area. Don’t let the name fool you – clothing is strongly suggested at this popular swimming hole! 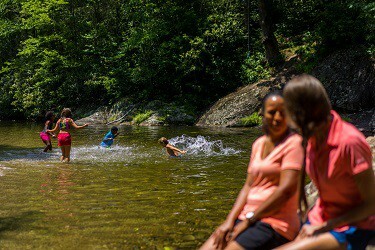 Located high up on the Blue Ridge Parkway, this picturesque (and very cold) swimming hole offers several jumps and places to wade in more shallow waters. The beautiful setting alone is worth the short hike down to the hole. Graveyard Fields makes for the perfect combination of hiking and swimming. This 3.2 mile hike offers multiple waterfall features and swimming areas to splash around in. This is a very popular hiking area, so make sure you plan for heavier crowds on hot summer days. Pets are welcome here, but make sure they’re on a leash. A word of caution, as these swimming areas are often remotely located and do not offer the reassurance of a lifeguard on duty: please swim and jump at your own risk. We advise you to always do your research on the particular hole you plan to visit and test the waters before jumping – NEVER dive, as you may not be aware of how shallow the water is. But if you keep safety in mind, spending the day cooling off at one of these area swimming holes will be a blast! Not only does every golf course in Haywood County boast spectacular mountain views at every hole, but it’s often a lot cooler here than other parts of the southeast. Talk about a win-win situation! 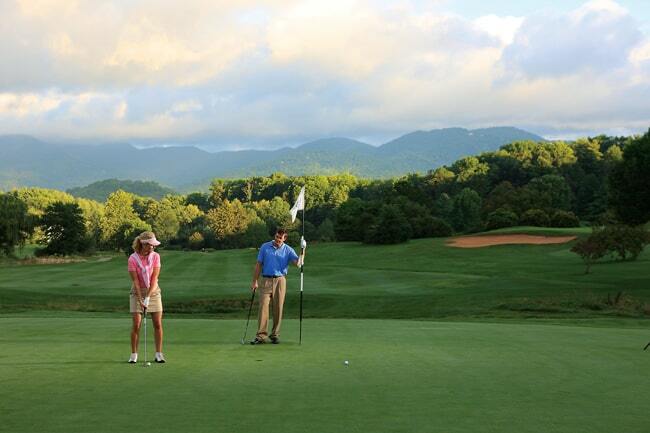 With five different golf courses to choose from, you can spend an entire week teeing up. It’s a paradise for any golfer! Explore our golf courses here! Panoramic views. Mind-blowing curves. Miles of beautiful parkway. It’s no wonder that Haywood County is a haven for motorcyclists. No matter your skill level, you’re sure to find a ride you’ll love. Make sure to stop by the Wheels Through Time museum in Maggie Valley to check out one of the world’s best collections of vintage motorcycles. 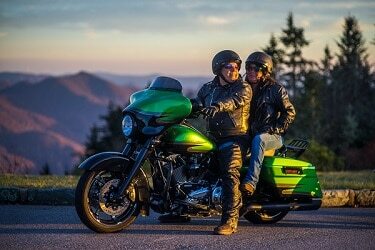 Get a free motorcycle route map! Do you crave the thrill of white-water rafting or the serenity of paddleboarding and kayaking? In Haywood County, you don’t have to choose. Spend the afternoon relaxing on Lake Junaluska or take a short day trip to a nearby outfitter. Don’t worry about bringing your own equipment: rentals are available for your convenience. No matter which one of our five mountain towns you stay in, it’s easy to get to some of the best hiking in the Great Smoky Mountains National Park. With more than one-half million acres of park between North Carolina and Tennessee, you’ll never run out of beautiful vistas. 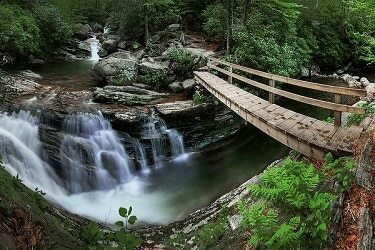 Here, you can find some of the most popular hiking trails in all of the park, like Black Balsam, Devil’s Courthouse, and the Art Loeb Trail. Don’t forget to download free maps of our favorite hiking trails! Tackle a trout in the Mountain Heritage Trout Waters. And by tackle, we mean with a tackle box! Purchase a 3-day, $7.00 fishing license to fish in the designated Mountain Heritage Trout Waters in Waynesville and Maggie Valley. This special 3-day license can be purchased online at www.ncwildlife.org or by telephone Monday – Friday, 8am-5pm at 888-248-6834. Did you forget your fishing pole and tackle box? Don’t fret! Stop by the Maggie Valley Visitor Center at 1110 Soco Rd. and pick up a free tackle box filled with lures and flies. You can also borrow either a fly rod or a spinner rod. Just put down a deposit for $5.00, which you will get back when you return the poles, and don’t forget to grab a Mountain Heritage Trout Water map while you’re here. And guess what? The tackle box is yours to keep, so get out there and hit the streams!